Over the past couple of weeks, as 2018 was coming to a close, I began to think my collecting goals for the next year. As I covered in a previous post, 2018 was all about redefining my collection. In doing so, I revised my collecting habits and focused my collection. As we move into 2019 many of my collecting goals will be focused. As for the sets I want to collect, the list right now stands at 11 sets. Topps Series 1 & 2 (counted as 1 set), Topps Update, Bowman, Bowman Chrome, Bowman Draft, Pro Debut, Heritage Minor League, Gypsy Queen, Topps Big League, Heritage (including High Number), Donruss. This may seem like a big list, but there were easily over 50 sets released in 2018. Most of these sets I will buy complete. My plan this year is to reduce the number of hobby boxes I purchase. There are a few of these sets that I will always want to buy a hobby box or three to open: Bowman, Bowman Draft, Pro Debut and Heritage Minor League. These are my favorite sets and I love opening those packs. I am considering buy hobby boxes of Gypsy Queen and Heritage, but a lot depends on the price of the boxes. Last year Heritage was priced out of my range because of the Ohtani autographs. Donruss has been a fun box to open in the past and I may just get one this year. The others however, I am going to buy as complete sets. I have met some great sellers on Twitter, like Christopher Torres (@CRT_Sportscards), that I definitely plan on doing some business with this year for my set and PC needs. As always, I will still buy a few packs here and there, just to see what the product looks like as it comes out. My intent this year is to start redirecting my hobby money to all aspects of my collection. First and foremost is my Athletics PC. Above all else, this PC is my primary collecting focus for 2019. In 2018 I ended with 8,230 unique cards in my PC. The total amount of cards on my Athletics checklist is 19,726. So, my collection stands at 41.72% complete. I also have quite a few uncatalogued cards for which I need to create listings before they can be counted in the PC. My goal for the A’s PC is to be at 50% complete by the end of 2019. This means I need to add approximately 1,633 unique cards to my collection, IN ADDITION to all of the cards that come out in 2019. There were over 600 unique A’s cards released in 2018. That means I will need to add roughly 2,000 cards in 2019 to reach this goal. The other goal I have for the A’s PC is to complete the base sets (including traded/update) for Topps from 1970-present, Fleer (1960-61, 63, 81-2007), Fleer Ultra (1991-2007), Donruss (1981-98, 2001-05, 2014-present), Score (1988-98), Bowman (1989-present) and Upper Deck (1989-2010). The Score run will be the easiest to complete as I only need 5 cards at this point. I will cover the status of this goal in a future post. I have quite a few player PCs that I am looking to organize and expand in 2019. My primary players include: Mark McGwire, Matt Olson, Matt Chapman, Jesus Luzardo, A.J. Puk, Austin Beck, Lou Trivino, Daniel Mengden and Daniel Gossett. I was fortunate to see many of these guys in the Minor Leagues, particularly with the Stockton Ports, and they are some of my favorites. My McGwire PC is going to receive the most attention this year. I need to take some time to reorganize it and catalog the cards I have in this PC. One goal I have is that I want to add 50 1987 Fleer Update McGwire and 50 1989 Upper Deck McGwire cards to the PC. These are two of my favorite McGwire cards along with the 1987 Topps. I do have individual goals for each of the player PCs, but I am not going to take the time of list each goal here. Suffice it to say that I am looking to add a significant number of base cards (including doubles) and autograph cards to each of these player PCs. It would be nice to get each one of them into their own 1.5” binder by the end of 2019. I am also considering adding at least 3 more players to the PC list in 2019. One prospect I really like that I am strongly considering is Sean Murphy. He is viewed as the A’s catcher of the future. Murphy will be starting the season with AAA Las Vegas and we could see him in Oakland sometime in 2019. I met him and got to see him play when he was with Stockton in 2017. He has a cannon of an arm. This year I will finish my current Rainbow project: 2018 Topps Update Lou Trivino. I currently need 3 more to finish it off: Gold /2018, Pink /50, Camo /25. There is another, Clear /10 that I would love to get, but only for the right price. For my collection the Rainbow only goes down to /25. Any card I get with a shorter print run is a bonus. I will be resuming my Matt Olson 2015 Bowman Draft Rainbow. I don’t remember where this one stands, but I started it a couple years ago after I happened to win a printing plate from this set for a very good price. I plan on starting at least one new Rainbow project this year. Not sure which player or which set or how many Rainbows, but one will be from a 2019 release. Two players I am considering are Matt Chapman or Jesus Luzardo. I mentioned in my previous post that I have quite a few sets that I have started that I have never completed. In 2019 I intend to complete some of those sets. There will be other sets that I add to this list, but I know I want to complete. Lists for most of these sets can be found on the Sets in Progress page on this blog. (Insert link) If you have any of the cards I need for my set, I would be interested in making a trade. I love going to Minor League Baseball games. It’s fun to watch players develop. It’s also a great way to meet prospects and get their autographs. This year I want to organize and expand my MiLB collection. The Stockton Ports are my home team and the Modesto Nuts (formerly A’s) is my secondary home team. My goal is to expand both of these collections by picking up all of the team sets I need from 1991-present. I also want to get all of the Pro Debut, Heritage Minor League and other major label Minor League cards from 1991-present for this collection. Another goal I have for my MiLB collection is to create some binders for the other Oakland A’s affiliates by level. For 2019, my goal is to pick up all of the AAA (Nashville and Las Vegas), AA (Midland), A (Beloit) and Short Season (Vermont) affiliate team sets from 2015-present. As a whole these goals do seem a bit lofty. However, over the course of the year, they are very attainable and simple. Again, these are my goals and they can change at any time. There many be a product that comes out that is simply amazing that I want to chase. Or there may be a new player that arrives at the MLB level that I want to collect. These are flexible goals. I just wanted to create a plan for myself as I head into the new year. Last year I redefined the direction of my collection, this year I want to move it forward and take it to the next level. If you don’t already, you can follow me on Twitter at @bicemusic. I am always open to bulk trades. Feel free to hit me up on Twitter or comment below! I love collecting baseball cards, I always have and I always will. I believe there is no wrong way to collect cards, as long as you are enjoying the hobby. Personally, I needed to redefine my collection, give it focus. It was wandering, I was buying the some of the latest product and only completing 2 or 3 sets each year. Also, I had a lot of Oakland Athletics card, over 20,000 cards at the time, but the organization was haphazard. Over the past year, I have spent a lot of time trying to refine and organize my collection. I have a lot of friends in the hobby that I have met through Twitter or Instagram. We would talk about our collections and our approach to building them. These conversations helped me to redefine how I collect baseball cards. In February, one of my friends Ben (@ourtradingcards) offered to send me a copy of his Oakland Athletics Master Collection Checklist. This checklist helped me to refocus my A’s collection. I was clearly able to see what cards I have in the collection. I was also shown how many cards I am missing from my collection. There were many cards and sets that I didn’t even know existed. I am very thankful to Ben for this checklist. I am still going to collect sets. My approach to buying these cards is still being refined, but I am limiting what packs I will buy and which sets I will buy complete. I used to buy packs of whatever came out from Topps and Bowman. These purchases left me with many cards, either duplicates or sets I don’t wish to complete, stored in boxes taking up space. My list of sets I am going to collect in 2019 is still being refined, but it will definitely include: Topps (Series 1&2, Update); Bowman (Base, Chrome and Draft); Gypsy Queen (my new favorite) and the Minor League sets (Pro Debut, Heritage Minors). There are others I am on the fence about, but I know my approach to buying these cards will be different than in years past. In the next few days I plan on writing a post about my collecting goals for 2019. There are certain cards and sets I wish to acquire in the next year. I am still working out some of the details, but I plan on posting my goals within the next week. 2018 was about redefining my baseball card collection. 2019 will be about taking it to the next level (hopefully). This article was inspired by a tweet from a friend of mine @BigShep79 on Twitter. He posed the question “Who is the one player (not on your team) you’d want to or do PC?” The one player that immediately came to my mind is Tony Gwynn. He was my favorite non-A’s player growing up and, in fact, he still is my favorite non-A’s player. In a way I do have a small PC of Gwynn. About 10 years ago I started to pull aside all of my Tony Gwynn cards. They currently sit in one of my boxes with some of my A’s collection. If I were to guess I would say there is probably about 50-75 cards in that stack. Most are base junk-wax cards, nothing too special. One of the more “interesting” cards I can remember is from the bottom of a 1988 Topps wax box. I haven’t bought too many more Gwynn cards since doing this, but I’ve been thinking about it more lately. In thinking about this non-team PC concept, I wanted to take it a step farther. I am going to select a position player and a pitcher from three different “eras” for whom I would start a hypothetical PC. The three “eras” are: current, childhood and vintage. Trevor Hoffman, San Diego Padres – not really a childhood guy, more like an adult era player (for me). He was my favorite closer not named Eckersley during the 1990s. Ernie Broglio, St. Louis Cardinals and Chicago Cubs – he was the Cubs return in the infamous Brock for Broglio trade. How did that work out for you Cubs? He is also a local (Northern CA) guy. Red Schoendienst, St. Louis Cardinals – I have been told that I look like his doppelganger. Dave Kingman, San Francisco Giants, New York Mets, Chicago Cubs, Oakland Athletics – technically he did play for my team from 1984-86, so he’s not a true non-team player. I have recently decided to start a PC of him. Kingman was one of my first “favorite players” and that is why I wanted to mention him here. There are plenty other players I could list, but these are some of the ones that immediately came to mind. What’s really interesting about this question is the diversity of the answers received thus far. One would think that guys like Mike Trout, Aaron Judge, Derek Jeter, Kris Bryant would have dominated the responses. Instead the players are as diverse as the collectors. Of 14 collectors who have responded, at the time of this writing, only two players have been doubled up: Tony Gwynn and Mike Trout. The list contains 14 other players including: Roberto Clemente, Wil Myers, Ryne Sandberg, Nolan Arenado, Bo Jackson and Julio Franco. It will be interesting to see where this list goes. Another facet that would be worth looking at is why? For most collectors when it comes to PC players the reasoning is more that just, “I like that player.” There is something specific about that player that really drew the collector to them. As stated at the beginning of the article, if I were to only select one my non-team PC player would be Tony Gwynn. Why Tony Gwynn? He was the absolute best hitter in my childhood/young adult life. Every time I saw him play, he would rack up a couple hits per game. I don’t think I ever saw him strike out in any of the games I watched. He was fun to watch. I remember watching the game in August of 1999 when Gwynn slapped a single to right-center for his 3000th career hit. There was just something special about watching Tony Gwynn. Feel free to comment below or on Twitter about your non-team PC selection. Let me know why! I would like to follow up on this article with other collector’s thoughts. After only 3 starts Oakland’s No. 2 Prospect, Jesus Luzardo, has been promoted to AA Midland RockHounds. During his brief stint with the Stockton Ports, Luzardo gave up only 2 runs and 6 hits in 14.2 innings. He also struck out 25 batters and walked only 5. In his last outing on April 17th he did not allow a hit and walked 1 in five innings against the Modesto Nuts. Luzardo’s first start with the RockHounds will likely take place on Tuesday at Corpus Christi. Right now Midland’s starting pitcher is listed as TBD for that game. Luzardo’s promotion may seem fast, but he impressed many people during Spring Training this year. Luzardo pitched in 3 games, 2 as a starter. In those outings, he did not give up any runs, compiled a 2-0 record and earned a save in his lone relief appearance. The top prospect is one of now four 20 year-old starting pitchers to make it to AA for the Oakland A’s in the past 20 years. According to Melissa Lockard (Twitter: @melissalockard) the most recent to do this were Rich Harden (2002), Trevor Cahill and Brett Anderson (both in 2008). Among this group Luzardo has the fewest Class A Advanced starts with 3. Both Cahill and Anderson had 13 starts each for the Stockton Ports in 2008. Harden had 12 starts for the Visalia Oaks in 2002 before earning his promotion. Interestingly enough both Cahill and Anderson have rejoined the A’s for the 2018 season. Cahill made his first start in Oakland on April 17th. Anderson is pitching great in AAA Nashville with a 1.38 ERA in 3 starts while striking out 20 in 13 innings pitched. The 20 year-old lefty was drafted by the Washington Nationals in the 3rd round of the 2016 Draft out of Stoneman Douglas High School (Parkland, FL). Luzardo was acquired by the Oakland Athletics with Blake Treinen and Sheldon Neuse (Oakland’s No. 11 Prospect) in the trade that sent Sean Doolittle and Ryan Madson to Washington. I have been thinking a lot about my card collection lately. I have a lot of Oakland Athletics cards, it is one of my passions. Recently, a new friend of mine Ben (Twitter @ourtradingcards) sent me a copy of his Oakland A’s master checklist. Looking through this checklist, I realized that there are a lot of cards I don’t have. There are some sets that I never even knew existed. I have decided that I am going to set collecting goals for myself each month. I am on a budget and I need to limit and focus my spending. This will help me save money for sets and hobby boxes I really want, like Bowman and Topps Pro Debut, while making progress on my Oakland A’s collection. Each month, I am going to pick up a few Oakland Athletics Team Sets I do not have. One will be a Vintage set. Vintage I will define as pre-1980s cards. One will be a set from 1980-1999. One will be a set from 2000-2017. The final one(s) will be any team sets from new releases. Note: Topps Gypsy Queen, Inception and Tribute also release in March, but I will likely be saving those sets for pickup in April. March is a release heavy month. The Mother’s Cookie Cards are some of my favorite cards. For the most part they have a full-bleed design (no borders), good profile photos and a nice glossy finish. These are typically limited in quantity (approximately 15,000 sets each year) because they were a Stadium Give Away (SGA). I chose the 1988 set because it is one I have been wanting because it was the first year I really followed the A’s. I’ve been a fan since 1985, but didn’t really start following intently until late 1987. I chose the 2009 Upper Deck because I’m pretty sure my Local Card Shop (LCS) has this team set and I want to support them while picking up something I need. The sets in these goals will not be all that I buy, but they will be the primary focus of my spending. The pitchers and catchers reported this past Wednesday. Position player reported to camp today. The first full-squad workouts begin on Monday. This is an exciting time of the year for sure! The Oakland Athletics will kick off their 35 game Spring Training Schedule (including split squad games) on Friday in Mesa, AZ against the LA Angels of Anaheim. The Spring schedule will conclude with the annual Bay Bridge Series March 25th-27th. One game in Oakland and two in San Francisco. I have always wanted to get a lineup card. I have seen people at Banner Island Ballpark with ones from previous games getting them autographed. I have never been lucky enough to get one from a coach or manager. Towards the end of the season I was at a Modesto Nuts game and in the team store they were selling game-used lineup cards. They were $25 and the proceeds went to the charity fund. I thought it was a decent price, but I didn’t think much about buying one until I noticed one detail: they were autographed by the Nuts players. This was a deal I couldn’t pass up. I looked through the cards to find ones where they played Stockton. I found a couple and settled on the one from Friday, July 28th. I wasn’t at that game, but it turns out that I was at the game the next day. I went with this card for 2 reasons. The first is that Sheldon Neuse, Oakland’s No. 13 prospect, went 3 for 5 and hit his first 2 home runs in the Athletics organization. Neuse had come over from the Washington Nationals with Blake Treinen and Jesus Luzardo in the Sean Doolittle and Ryan Madson trade on July 16th. The other reason is that Seattle’s No. 1 prospect, Kyle Lewis, is on the lineup card (on the bench) and he autographed it. 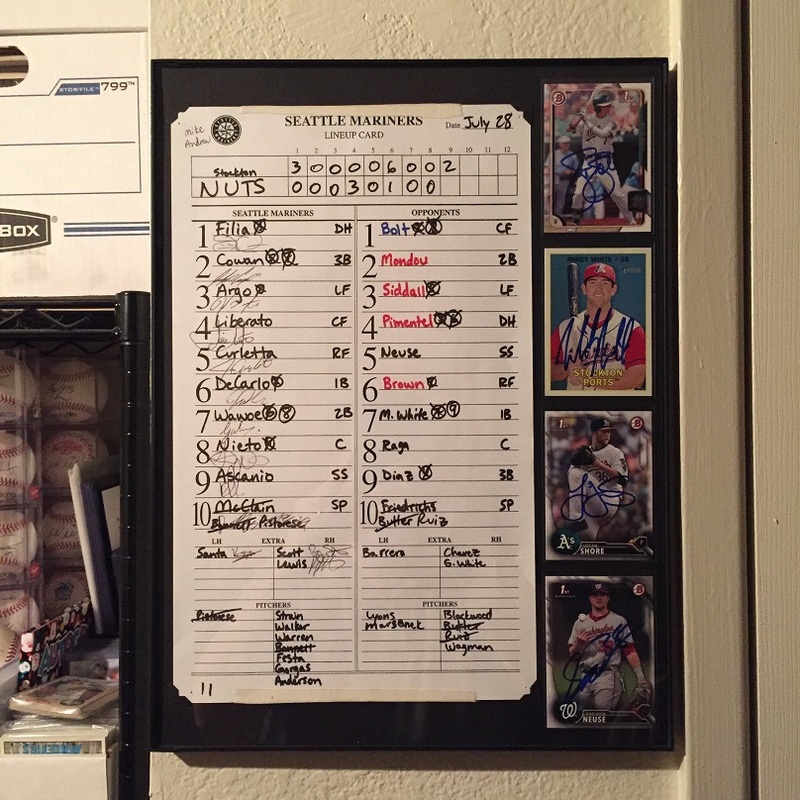 As you can see, I have since framed the lineup card with some autographed cards of some players on the Ports. I don’t think I am going to get the Ports players to sign the lineup card. At this point it will be too difficult. Many of them will likely not be on the team next year. Times change. People change. Websites change. I want to keep this website up and running, but I don’t have time to post the type of content that I initially envisioned. So I decided last week to rededicate this website to my baseball card collection and Oakland A’s memorabilia. I have already started to add pages about sets in progress, including lists of cards I need. I plan on adding more info about my large and still growing autograph collection, as well as pages for players that I have in my personal collection (PC). I will still occasionally us this as a forum for news and info about the Oakland A’s or their Minor League System, but for now I will be utilizing this site primarily for my collection. As always if you have any comments please feel free to post them! I went to an Oakland Athletics game on September 26th and I picked up another MLB Authentic baseball. This time I got a ball from pitcher Jharel Cotton. The game was on August 14, 2017 against the Kansas City Royals. I chose this ball because Jharel Cotton is one of my top two favorite pitchers on the A’s right now. He was bounced around a little bit this year between AAA Nashville and Oakland. He has started to come around as of late and I think he is going to be a solid starter next year. This ball had a lot of “life” in it. It comes from the Top of the 6th inning and was used against three different batters. The Authentication details are below. The first batter was Jorge Bonifacio, who struck out on a 2-2 count. Next was Alcides Escobar who hit an infield single on the second pitch. Finally this ball was popped up to second base by Alex Gordon. Both the single and the pop up was fielded by Chad Pinder. Again there are a lot of details in the Authentication which is one of the things I love about these items. I have made it a goal for myself to pickup a piece of MLB authentic memorabilia whenever I go to a Major League Baseball game. Ideally, I would like to pick up a ball or something from that particular game that I attended. However, if that does not work out, then it should be something from one of my favorite players. On September 23rd, I went to an Oakland Athletics game with my Brother and my Nephew. I picked up my first authenticated ball. This ball comes from a game on July 14, 2017. It was a double hit off the bat of Bruce Maxwell against Cleveland Indians pitcher Carlos Carrasco. I chose this ball because Bruce Maxwell has always been one of my favorite players. I first met him in 2013 when he was promoted mid-season to the Stockton Ports. He has always been nice to me and my family. When Bruce was in Stockton, he would come out to the field early an talk with us for a few minutes before he had to go stretch. Even now as a Major League player he will still talk to us if we see him at a game. I know Bruce understands that things like this mean a lot to people and that is why he is a fan favorite. The cool thing about the authentication is that you can go to the MLB Authentication Website and get details of the “life” of the ball. He are the details for this particular ball. There is a lot of information here such as type of pitch, pitch speed and the count. In this case it even includes the hit launch angle, hit speed, distance and who fielded the ball. This is the third MLB Authentic item I own. I am really happy to have it in my collection. Tomorrow, I will post the ball I picked up at the A’s game on September 26th. My first two items are a couple of bats thatI picked up at the A’s Fan Fest back in January. I post about those at a later time.